The Cost of Corruption – International Expertise to make sure you never find out! 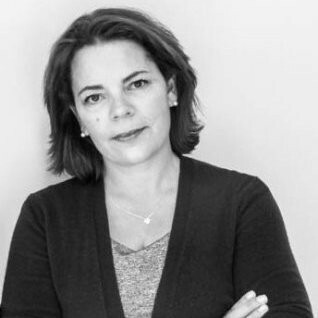 Sandra is a Director of Prolog Consulting, a South African based issues and crisis management company supporting many industries and organisations, from both the private and public sectors, as well as civil society. The team has over 40 years combined experience of helping companies operating in South Africa to navigate the most difficult issues and crises. They have exported their experience of consulting to clients grappling with corruption and other reputational issues, and are now able to offer this expertise to organisations world-wide. It is worth noting that there are particular challenges linked to operating a business in South Africa, which is Prolog’s historical focus. Here organisations often face complex, even existential situations. These include corruption, anti-competitive behaviour, regulatory and policy issues, collapsing infrastructure and industrial action. In-depth regional understanding allows Prolog to provide counsel based on the ever-changing commercial, political and socio-economic landscape in which their clients operate. Working with experts can assist in mitigating the reputational risks associated with corporate corruption and other unethical practices. Prolog has a successful track record of navigating these in South Africa for both local and international businesses. This, along with great client relationships, has supported their expansion into a wider marketplace. Companies operating in countries outside their home base are particularly at risk of being exposed to a corruption crisis and there are few corporate crises which can threaten the continued existence of a company as significantly as the discovery of corruption. For example, in order to compete in the local business environment, an organisation may be forced to engage in customs and politics in a corrupt or unethical way. That is no excuse though. Even if it happens inadvertently (i.e. through extortion or pressure, or through the actions of some executives or employees), the fines can run into billions of US dollars. A company also needs to take into account the cost of restitution and remediation, the loss exceptional employees, and rebuilding a reputation. Today’s anti-corruption laws are wide ranging and can be enforced by local and global regulators and enforcement officers. Interested in a quick run-down on the do’s and don’ts on tackling a corruption crisis? 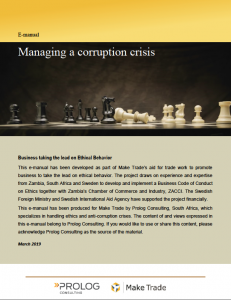 Prolog has developed a free practical e-manual for us on ‘Managing a Corruption Crisis’ which can be downloaded here.